Good evening everybody and welcome to Wrestling World Congress Smackaround! I’m S. Sterling Samuels and we’re in beautiful downtown Compton for tonight’s show. Let’s welcome in my partner Paul Bunyon Jr! Give me that mic, time to let a real man talk! We’ve got a great show for you tonight. We’re starting off hot with a title match- Sean “The Irish Taliban” O’Reilly will be taking on The Dismangler and this ought to be a good one! That’s right Paul. The Dismangler has had his sights set on The Irish Taliban since he stole The Dismangler’s lucky horse shoe. After that it’s a tag match with Biff and Tad, The Preppy Punks. Yeah, tonight they’re fighting Iron Moose Johnson and Refrigerator Raymond, and Biff has promised that after the match, Moose is getting a makeover. You don’t want to miss that! And speaking of don’t miss matches, we’ve got a match coming up with a really unusual stipulation. This has been a long time coming, the bad blood between these two goes all the way back to last year’s pay per view, WWC Wrestling Implosion! Shakespeare Romeo is taking on The Diamond Ninja in a loser gets deported match. Yes, and there’s some controversy here since The Diamond Ninja was born in Illinois. If he gets deported, where is he going to go? He’ll be a man without a country! Later tonight Ace Rocker takes on El Hijo De Tuna, but first, let’s go to the ring for our first match. It’s a rematch from their famous 2013 bout, the Thrilla in Akron. 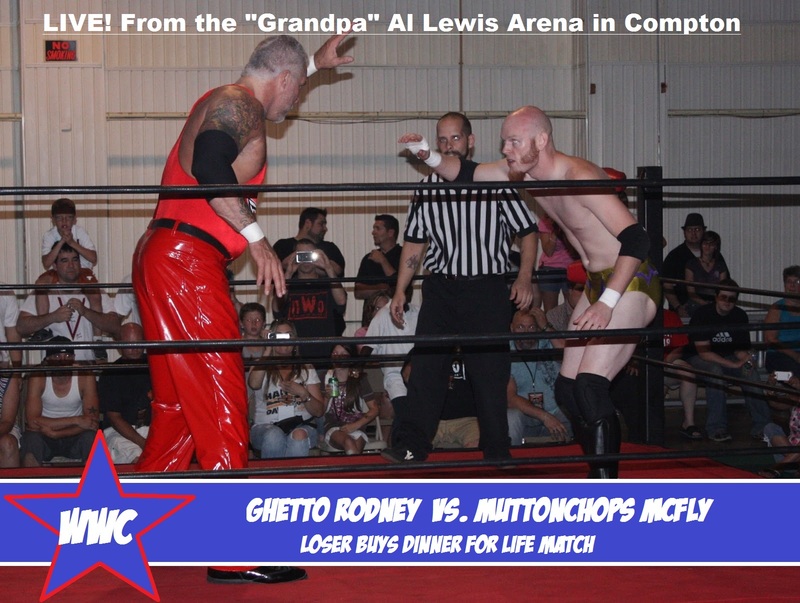 It’s Ghetto Rodney vs. Muttonchops McFly in a loser buys dinner for life match! Fans, let’s go to the action!